Ah, to be a fly on the wall in the writers’ room of Star Trek: Discovery. What really happened there? How much of this show grew from Bryan Fuller’s original ideas, and how much of it was scrapped or retooled? Did the writers change the fundamental course of the season midway through, and were they justified in doing so? Did they have to fix things on the fly and figure out ways to fit a patchwork narrative together into something supposedly coherent? Or was this the plan all along? I’m somehow guessing not the latter, at least for some of it. I ask these questions after having watched "Will You Hold My Hand?" 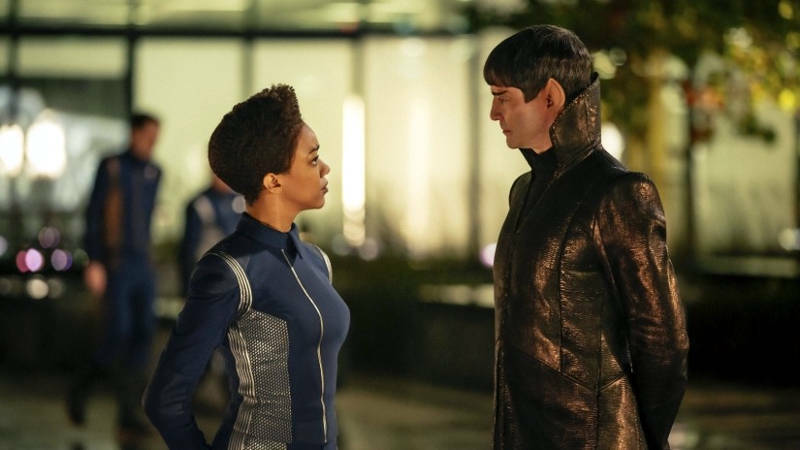 take a season-long arc about Starfleet’s war with the Klingons and solve it in five minutes with a plot device that brings new definitions to the word "contrived." I had hoped this finale would be more resolution than cliffhanger. It was. That’s a blessing, albeit a very mixed one.